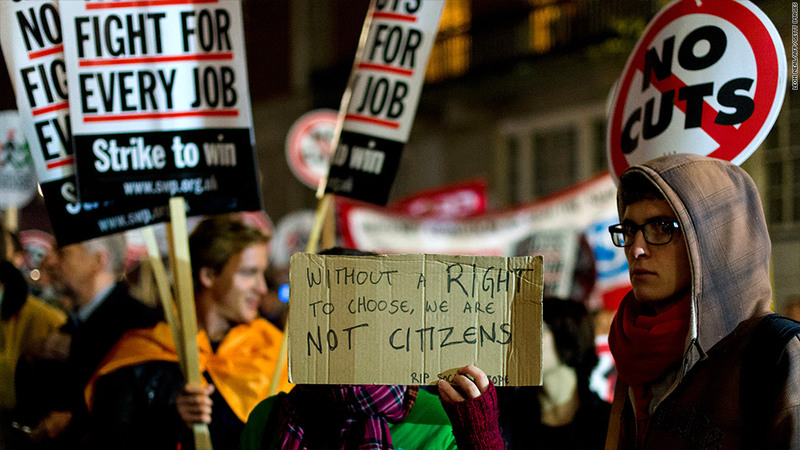 As Europe's economy has struggled, tough austerity measures have drawn protests like this one in London last fall. The message was unmistakable: The austerity push that has dominated Europe in the past year will continue even as the economy struggles. One after another, politicians and central bankers queued up at the World Economic Forum in Davos to warn against the risk of fiscal complacency. They urged European governments to stay the course and continue to cut budget deficits, make economies more competitive and drive closer eurozone integration. But with the 17-nation currency zone economy set to contract for a second year running, regional leaders are still trying to square the circle of austerity and growth. The hope is that cheap central bank cash will sustain confidence and activity long enough for reforms to bear fruit in two or three years' time. Trevor Manuel, South Africa's national planning minister and a former finance minister, was blunt with his criticism. "It's not going to work," he said. "Deficits are going to continue to grow in the absence of growth," he added, saying Europe needed a change of mindset. Other observers were also clear about why the region was not growing. 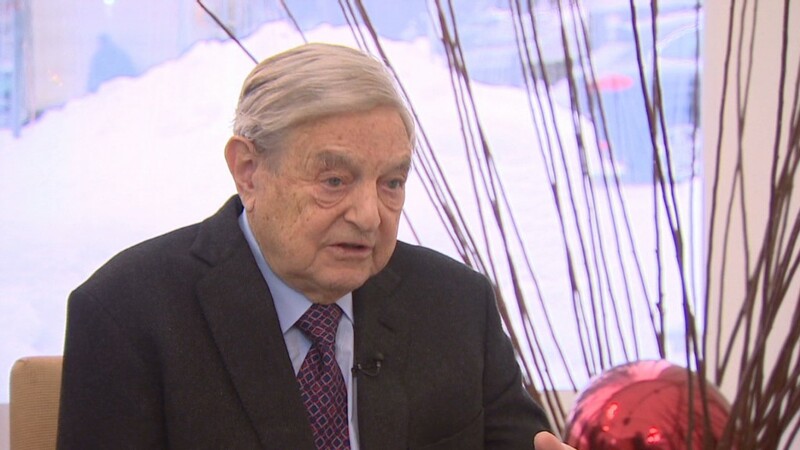 "Europe as a whole is suffering from this austerity program, which is pushing it into recession," billionaire investor George Soros told CNN. "Europe remains in a trap." A year ago, the euro stood on the brink of collapse as Italy and Spain saw borrowing costs soar to dangerous levels. That risk has passed thanks to the European Central Bank, aggressive fiscal consolidation by indebted governments and steps toward a closer union. And none of Europe's top officials showed any signs of moderating policies that have brought a return to financial stability, although not growth. German Chancellor Angela Merkel said Europe must make the most of the pressure created by the crisis to push on with reform. Fiscal consolidation and growth were two sides of the same coin, she argued. Mario Draghi, the president of Europe's central bank, took a similar line. The painful medicine was necessary and was already strengthening the European economy, he said. "Fiscal consolidation is unavoidable," Draghi said. "There can't be any sustainable growth ... achieved through an endless creation of debt." British Prime Minister David Cameron told business leaders that the only way for countries to compete was to "deal with your debts, cut business taxes and tackle the bloat in welfare." And his finance minister rejected a suggestion from the International Monetary Fund that it might be time to review his austerity drive -- already blown off course by a stagnating economy -- just before it was confirmed that GDP shrank in the fourth quarter, leaving the UK teetering on the edge of a triple-dip recession. Draghi acknowledged that fiscal consolidation was "contractionary" in the near term. At the same time, he said governments can mitigate that effect by acting quickly and decisively, introducing structural reforms and making sure spending cuts and tax increases did not damage capital investment. "Front-loading is important to reap the benefits of credibility and lower interest rates," he said. Mario Monti, Italy's outgoing prime minister, said governments should do a better job balancing fiscal consolidation and growth. But he also trumpeted the success of his program that commits Italy to eliminating its cyclical budget deficit this year. "Whatever the next government in Italy, I hope they will be able to keep the same spirit of emergency and urgency that we felt as we were on the brink of the catastrophe," he said. -- CNN's Poppy Harlow contributed to this article.